People email us updates and questions. Pam and I appreciate this and many of our posts have started with updates and questions like "how do you use your compass?" I used to give courses for HP in Australia and learned then that one of the best ways to learn is actually by teaching. So, please feel free to contact us using the link in the right column. I tried your “approach on port and find a hole to tack into” technique in the last two races on Sunday, RQYS. It worked really well, for some reason it seemed a lot easier to see the obvious midline sag and be able to tack in front of the starboard tackers all luffing each other. It must be pretty challenging doing this in a Worlds-level event though with so many on the line. Do you only do it if it’s a longer than usual line? 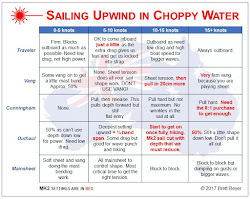 Do you try to time it to tack onto starboard then just go go go, or tack with still time to luff and defend etc? 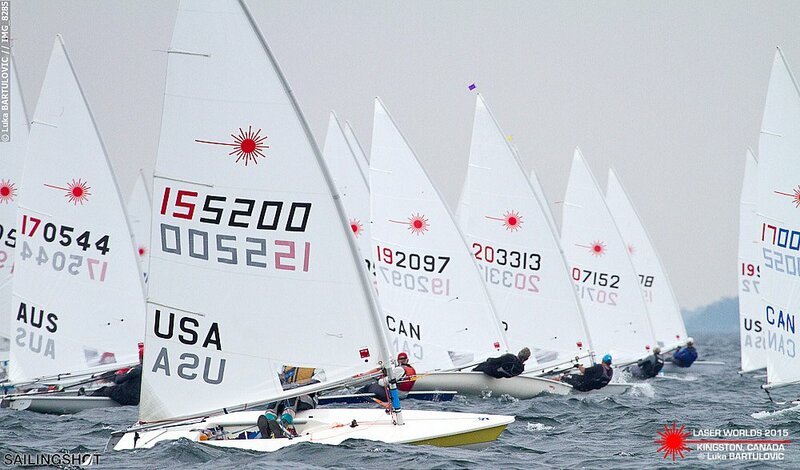 The more competitive the fleet, the more risky the port-tack approach. With a world's fleet, it's more difficult at the favored end of the line where the best sailors are because there's a chance that the person you tack below is good at defending and can shut you out. With the prevailing wind from the southwest, there were no line sights looking at the committee boat, so this was another reason favoring a starboard tack approach. There was some current that flowed from right to left. This made starting at the pin very tricky and, in my opinion, too risky. It also made starting at the committee boat really hard because there were others trying to get into the same spot, especially a really good fellow from NZL who was great at judging the current. But starting at the committee boat had one big advantage - being able to escape from a bad start by tacking away and then back again as necessary. But it was a go-left course and the best starts tended to be near the pin which was usually favored. But it's hard to judge the wind on port or in the middle of the line. And I like to circle the committee boat every 2 minutes to get compass readings before making a last-minute decision of where to start. 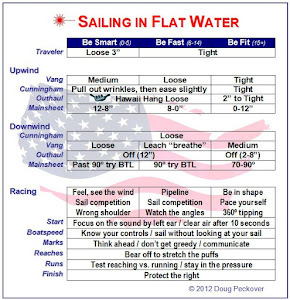 Keep making wind readings at the committee boat, leaving all options open as long as possible. A warning: if you look closely, there was a platform at the back of this committee boat. As it rocked up and down, this platform went up in the air and then crashed down under the water. I was less than a meter away and it could have damaged both my charter and me. Starting at the committee boat can be scary! If pin-favored, sail down the line watching the line sight staying on top of the sag. When 2/3 of the way down dip below a few boats and then pull the trigger a little before the others. Like this when it works, blue top on the right. It’s the great guys such as yourself, Beyer, Bethwaite et al who get there early, and use your experience to experiment for the conditions, pace one another, and reassert that edge in speed, who usually do well. I guess this is a psychological advantage as much as a real speed advantage? It's both, and it's not surprising that the best people arrive early to practice. This is especially important for people like me who do not have training partners back home. But the best part is being able to practice with the best master sailors in the world. PS With your meticulous and fascinating race-by-race observations, I still think your blog is far and away the best Laser blog ever, if not the best sailing blog ever! Pam and I like to share what we learn and really appreciate when it helps others. Great start so close to the boat (end) in the above sequence. Did you sail on the layline towards the boat end, or slightly above or below? Another concern is that I might be 'cut off' by a boat to leeward heading up a bit to make my start miserable. How does one prevent that, if possible? In these conditions (windy), always above so I can drift down. 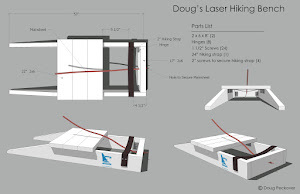 The approach is controlled by lifting the centerboard as shown in the first picture. People almost always drift down too much in the last few seconds. The Kiwi mentioned in the post was really good at judging this. If there is a chance of being cut off, put on the brakes by pushing out the boom, start in the second row, and then tack to get clear air. This is still a good start. It's interesting to note that ESP in the last picture bailed, went right, and won the race! Thanks; at least two techniques I will need to practice! One more thing: even though my cunningham and downhaul were strapped in tightly, my vang was not. In a breeze, it's too easy to get into irons with a tight vang, so remember to crank it on after the start.